Alright folks, we're back on schedule with our weekly giveaways. And this week we're thrilled to be giving away the latest from Jay-Cyn Designs and Birch Fabrics! We're giving away a fat quarter set of the entire collection! Check out the Just For Fun collection here. Everyone has a chance to win, all you have to do is leave a comment on this post answering the question below and you will be entered to win. The giveaway will end at 8am PST, Monday, July 29th. We will announce the winner later that same day. The winner will be chosen by random.org. What is your favorite print from the collection and why? Please no more than 5 comments/entries per contest post. Also leave an email address so we can contact you if you are a winner. I love the bears and the elephant prints! But I don't want to have one any day soon! I think my fave is the chevron print. Love the 'staches, too, though. I like the elephants. Because elephants. The bicycles, we are a biking family! Or at least trying to be, my oldest is learning how to ride a bike! The bicycles are my favourite. I can't drive so I cycle everywhere - or used to - at the moment I walk with my 6 month old but I'm looking forward to getting him a bike seat! I like the elephants prints. Love the colors!! i am on your mailing list. Thanks for the chance to win! I love the camper print and the bicycle print!! They are soo cute!! I love the campers the most! Love the camper print. just so different and adorable. I'm torn between the Elli fam and the skinny chevrons! Love them both. I love Camper Multi, looks retro and original! The dots would be my favorite, but love them all!!!! I love it all, oh I sew want to win this set to feature on my blog ! I love elephants and the chevron. Oh my ! I love the campers because my husband and I are looking for one right now! I love the bicycles. It reminds me of my cycling mad Dad! My favorite is the bears! My daughter and I love reading Goldilocks and the three bears and this fabric reminds me of it. I love the bicycles! I want to make a liner for my bike basket and that fabric would be perfect! I pinned my favorite! http://pinterest.com/pin/145170787961388088/ Thanks for the giveaway! Love- Love the elephants, they are so cute! I also receive the newsletter! I love the polka dots and elephant prints! too cute!! Would love that for a nursery! I love the elephant fabric because my mom loves elephants and i could make her something adorable with this! The bears are my favorite. Love the bear print - perfect for us California babies! Love the camper print. Would be perfect for something for my parents. I love the bicycles ... they just make me think of all the summer fun I've been having with my Little!! I tweeted about the giveaway (@knittybitties)!! Love the Campers! Just because I love to camp. Tks fr the chance! I love the moustaches - too cool!!! love the bikes and the elephant! I love the bear hike! I love the elephant print, it would be beautiful in a child's bedroom. The colours are perfect together. I'm already on your mailing list, I hope that gives me another entry! They're all really cute but I am partial to the bike print because my husband and son love biking. Would love to include that print in quilts for them. how can I choose a favorite? if I have to rank them the bikes are my first fave with campers coming in at a close second! ...and I LOVE the bike print, I'm a sucker for bike fabric! I like the one with the caravan or trailer? Don't know what you call them but they are so cute! The Multicolor Campers is my favorite print. The reason is we prefer to buy vintage campers and restore them. It`s also a fun print and I like the vintage look. I love the elephants! They're just fun and I find elephants so fun to watch. All of the colors here are beautiful! Love the camper print! This fabric looks so fun. Oh the possibilities! The bears. We just returned from Alaska and to my son's disappointment, didn't see a bear! The bikes are great too as are the dots. Thanks. I like the camper print because it reminds me of the camping my family did when I was young. I think my favorite is the mustache print, because my daughter is so into them right now. Very trendy. I love all these prints!!!!!! How to choose just one? I guess my favorite is the camper print, since it reminds me of childhood summers long ago.. but I adore the elephants and chevron just as much, and the colors are perfect! I shared this giveaway on Facebook!!! The camper is my favorite. Would be great pillowcases in my motorhome. I pinned the camper print!!! I love them all! But i think I love the bikes most. So cute! I love the camper print or the elephants!! I love the skinny chevron. It would go with so many things. My favorite is the bears. I just really like bears! I adore the camper print. Just makes me super happy! I love the bicycles. It reminds me of the days in childhood I would escape home on my bike and ride until my legs couldn't pedal anymore. Now my escape is quilting! I like the camper print-something so very retro about it. Thanks for the chance. So hard to choose. They're all great but those bears have the edge. Love the campers because it reminds me of all the fun times we had camping when I was a kid. We didn't have a camper like that, though. We slept in the camper shell on the back of a pick up. I would have to say the bikes as my husband and son bike a lot. I also love the campers but sadly we don't own one! I love the bear print. We have moved to the Pocono Mountains and we occasionally see bears in our neighborhood! I love the camper print! I love the polka dots. They go with everything! love the campers. very retro. polka dots and chevrons get me every time! I do really like the elephants as well though. Love the bicycles...because I bicycle! The trailers are my favorite. We are currently looking at buying a teardrop trailer from our renewed trip for camping after spending a week in Alaska. My favorite print is the bears. They're adorable! I love those sweet bears - the colors are dreamy! I love the multi campers and organic fabric is so fabulous! Thanks for a great giveaway. Love the camper trailer! It reminds me of my Grandma and Grandpa camping in their tiny tiny trailer :) The chevron and dots are my second choices. The campers are so cute. I'm on the mailing list. Love the camper print - talk about caravanning in style! I love the campers and the bears. I think this collection is all about the fabulous colors, love them all. I love the campers and bears. I think it is all about the colors, they are all great. I like the Staches Multi. It's cute and whimsical. I adore the cute bear print the most - I love and collect bears items! thank you! I get the FW newsletter! thank you! I love the campers!!! What a great summer print! My favourite is Bear Hike in multi. Thanks for a lovely giveaway. The campers are so stinking adorable!! The bycicles, my three kids love to ride their bikes! Love the campers, so cute! I love the bikes. They just symbolize beautiful summer days! I love the bikes, oh no the moustaches, wait, the elephants... ohh I can't decide. I'm already on your mailing list.. I really like Bear Hike. The campers of course! I love camping (although we camp in a tent) Also campers are quite useful for backyard sleepovers! Got to be the moustaches! I've just joined the mailing list. The Multi Camper print - wonderful! I love the bicycles - beautiful colours!!! Thanks for the chance! 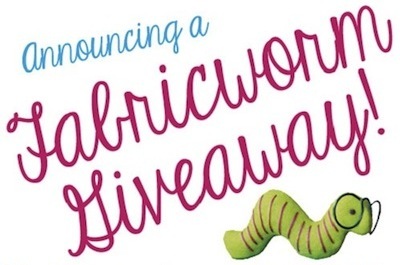 I am already on the Fabricworm mailing list - thanks!! I have always had a love for elephants so I am in favor of that print. I really like the Skinny Chevron Multi. Thanks for the great giveaway. I'm on the mailing list, thanks. I Love the Ride Multi, because it reminds me of my husband and I's first trip to Amsterdam!